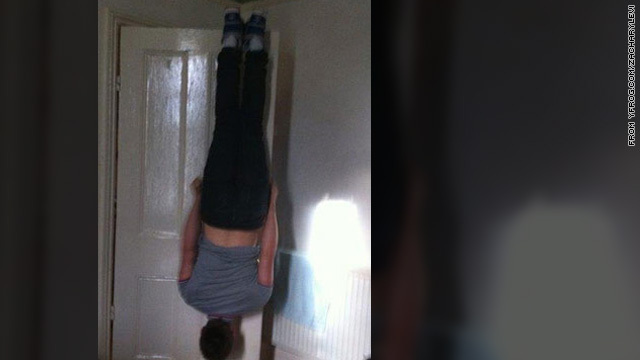 Levi tweeted a photo he found of a man hanging upside down by his feet in a doorway, not unlike a scene in the 1989 "Batman" where Michael Keaton's Bruce Wayne is caught doing the same thing. Levi's tweets have been more and more influential ever since he launched "The Nerd Machine" website just over a year ago. His supporters helped drive "Chuck" to a fifth season. So far, a Youtube video uploaded a few days after Levi's tweet showing various creative methods of "Batmanning" around the campus of Purdue University has 750,000 page views. From the looks of things, a few more Batfans (or maybe "Chuck" fans) have given it a try. It's certainly a unique way to show off "Batman" fandom. Who knows, maybe we'll even see a few examples of it in the lines for "Dark Knight Rises" midnight screenings next year? In any case, be sure to follow Levi's advice, and be careful out there, kids. Are white people this bored that they have to do stupid stuff like this? Is mommy not paying enough attention to you so you gotta do this to be cool to your friends? Give me a break...and this is coming from a white guy, thank you very much..
What else would you like them to do when they are bored? Please give me plenty of examples. If this catches on, neurologists are going to do a booming business. Oh please, there are plenty of stupid blacks, Mexicans and Asians out there as well. At least we're stupid in a funny way. That Youtube video is awesome! It's got to be rough on the ankles though, huh?